After years of legal wrangling, Metrolink has settled most of the outstanding lawsuits arising from the 2005 Glendale crash that killed 11 people and injured about 180, the second-deadliest in Metrolink’s history, attorneys said. Metrolink has agreed to pay $30 million to settle the majority of the approximately 150 claims and lawsuits filed against Metrolink, according to the lead plaintiff's attorney. The remaining cases are expected to be resolved in the next month, plaintiffs’ attorneys said. Any cases that are not settled are scheduled to go to trial in January. Metrolink could not immediately be reached for comment. A claims report in a July agenda for Metrolink’s board said it would be paying $3,901,500 in seven recently resolved lawsuits. Most of the cases involving serious injuries and fatalities were settled in a flurry of mediation talks in the last six months, attorneys said. Plaintiffs' attorneys said Metrolink showed little interest in settling the larger cases until this April, more than four years after the Jan. 26, 2005, incident, which was the most severe in its history until last year’s Chatsworth crash. In the 2005 crash, a Compton laborer parked his Jeep Grand Cherokee on the tracks and doused the interior with gasoline in what he later claimed was a suicide attempt. A three-car southbound train, which was being pushed by a locomotive, slammed into the car, skidded down the tracks, then derailed. The lead passenger car crashed into an idle freight train, jackknifed and collided into a passenger train going the opposite direction on its way to Burbank. “Thus far, we believe the Glendale settlements have been fair and reasonable given that Juan Alvarez, who parked his jeep on the Metrolink right-of-way, has been subsequently convicted of 11 counts of first-degree murder,” Ringler said in a statement released today. [Updated at 12:02 p.m.: In 2005, a Compton laborer parked his Jeep Grand Cherokee on the tracks and doused the interior with gasoline in what he later claimed was a suicide attempt. A three-car southbound train, which was being pushed by a locomotive, slammed into the car, skidded down the tracks, then derailed. The lead passenger car crashed into an idle freight train, jackknifed and collided with a passenger train going the opposite direction on its way to Burbank. 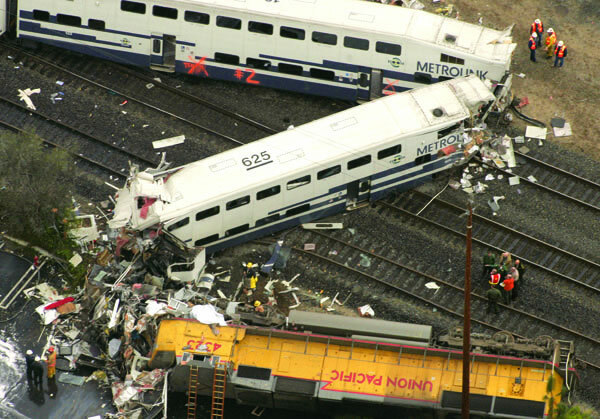 In the immediate aftermath of the crash, attorneys for victims focused on Metrolink’s so-called “push-pull” method, in which trains are pulled by a locomotive from the front while traveling in one direction, then pushed from the behind in the other, rather than turning the train around. Because the lighter passenger cars are more easily derailed, the catastrophe could have been prevented had the locomotive been at the front of the train, attorneys argued. Last year, an appellate court struck down that theory, saying Metrolink couldn’t be sued for negligence based on the “push-pull” method because it is allowed under federal regulations. A 2006 Federal Railroad Administration report also concluded that there was little difference in safety between trains that are pushed or pulled by locomotives, and that abandoning the practice would be impractical and possibly more dangerous. FULL COVERAGE: Check out The Times' investigation into Metrolink's safety record.